I've noticed that this series has shrunk in page sizes over time. The CS4 version had 496 pages, CS5 with 304 pages and now the CS6 version has 284 pages. I don't have the CS4 WOW book so I can't say for certain what material has been dropped. Anyway, that's not important because the book is still great! This book is for the intermediate and professional uses. You need to have the basics to fully appreciate the content. This is a tips and techniques book. There are plenty of practical tips. One thing I like about the series is they use real life examples. Many artists have their work featured and there's commentary explaining how their working process. The writing is concise and easy to follow. There are many neat tricks that aren't featured in official training guides. These are what set this book apart from others. There's no more disc with the book. You've got to download it from their WOW! Online website. Shouldn't be a problem unless you have no internet connection. Since this is a series of books, some of the material in this CS6 book is repeated and updated from the CS5 book.There is a lot of new content too. Thank you so much for the posting and the YouTube video. Glad you like! 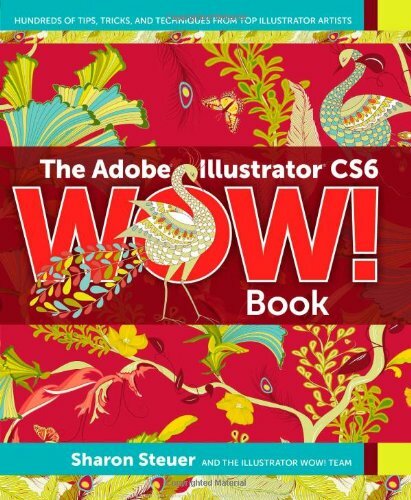 Please contact me if you want the code to download the PDF booklet update to the book… The Adobe Illustrator WOW! Booklet for June 2013 CC Release.